Glen Fogel, Man Quilt #8 (Ben), 2015, H&M corduroy blazer, corduroy, 58 x 47''. Surprising vulnerability and an intriguing backstory animate Glen Fogel’s seductively high-tech new show, “Why Don’t I . . . Pretend to Be Your Dad.” In the middle of the gallery’s narrow room, two black glass screens hang from the ceiling, flanked by what appear to be—in dim light—monochrome paintings or sound-absorbing panels. 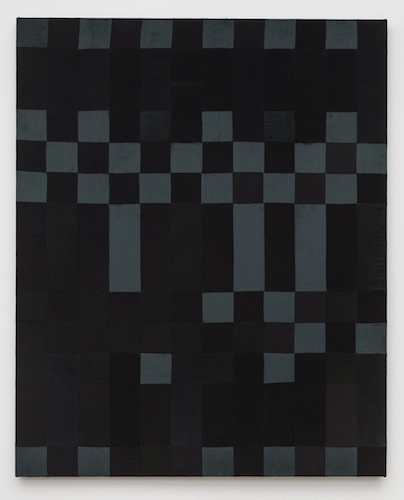 They are, in fact, taut quilts, each one made from acoustic foam and clothing worn by a man in the artist’s life. The garments identified in the works’ materials, such as the Tommy Hilfiger “mismatched navy checked suit” of Man Quilt #1 (Dad), or the H&M corduroy blazer of Man Quilt #8 (Ben) (all works 2015), act as surrogates for these male figures, witnesses smuggled by Fogel’s psyche into this intimate, abstract, and nightclub-y installation. Music and dramatic changes in colored LED lighting establish shifts in mood, while a narrative emerges from the white text that appears, like closed captioning, at the bottom of the tall screens. The video, which shares the exhibition’s title, is a condensed, remixed, and obscured version of Andrew Haigh’s critically acclaimed indie feature Weekend (2011), which is based loosely on the filmmaker’s fling with Fogel in 2002. Thus, the dialogue spoken by the character Glen in Fogel’s video is actually a reappropriation of his own words (or of Haigh’s memory of them). The gesture is notably devoid of defensiveness or hostility, though. It’s motivated by curiosity and a desire to continue if not the intense conversation started long ago then a new one instigated by their respective art practices since their encounter. It’s a fascinating kind of collaboration, and Fogel’s sincerity and self-exposure, combined with his austere production, is captivating.